JOB2SEA has today a global reach and is directly targeted towards the maritime industry. Seafarers and maritime professionals are our audience and we have users from around the world, in more than 180 countries! The majority of our users are however from the United States and Northern Europe, primarily Denmark, UK, Poland, Sweden and Norway. Our large maritime reach and an average of 63,000 page views makes our site an ideal platform for general advertising, and now we have made space available for company banners on our front page. 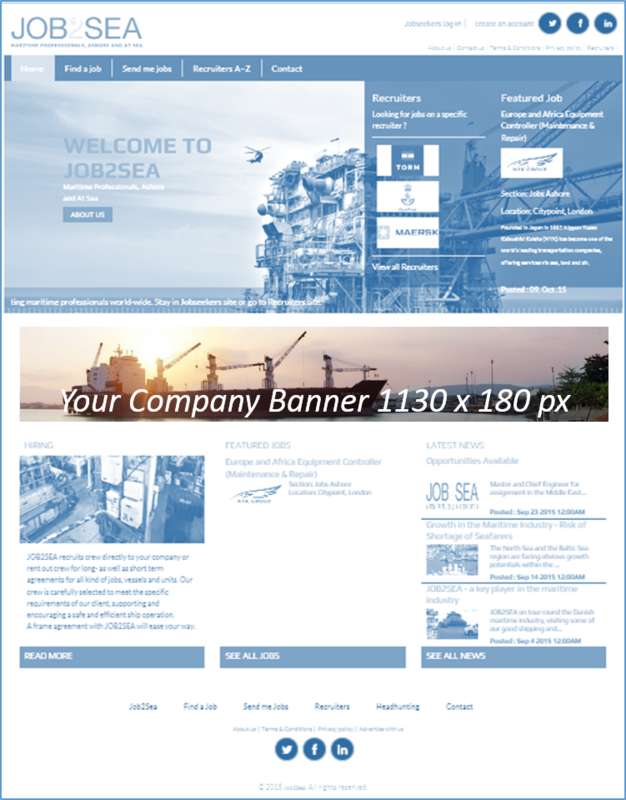 Our new feature allows you to advertise your company on our front page www.job2sea.com with a direct link to your company reaching more than 12,000 active professionals within the maritime industry at an utmost favorable price. Your banner will be published within 24 hours. JOB2SEA is a valuable partner in the industry, with all the potential for a fruitful cooperation.